Last year, I realized something that changed the way I look at myself and my writing. Over the course of my writing career, I’ve called myself many things: journalist, essayist, columnist, editor, reporter, researcher. (I’ve also called myself other names at times, like stubborn, stupid, crazy, and masochist – especially when I’ve struggled to meet writing deadlines.) When I began writing fiction a few years ago, I added the descriptors of novelist, author, plot architect, and starry-eyed dreamer. For me, ‘art’ always referred to visual or performance genres. 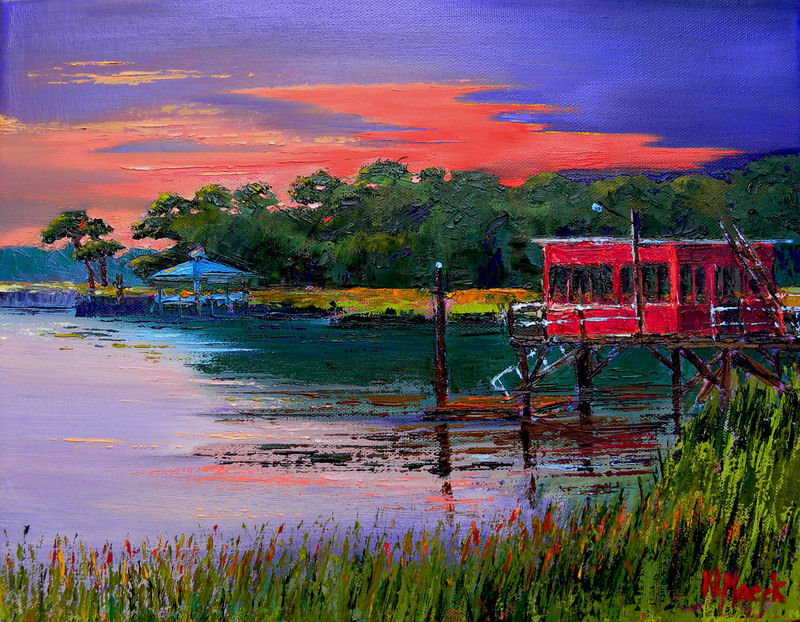 Art is the domain of my sister when she paints beautiful marsh landscapes in oils on canvas. Art is my daughter bringing a character to life on the stage, or playing haunting melodies on a flute or piano, or throwing clay on a wheel to transform it into a smoothly shaped bowl. Art is the creation of something new and tangible, and though I produced countless pages of words, I just never felt it rated as ‘art.’ I didn’t use paints, or clay, or costumes or musical instruments; my tool was a word processor, and my product was all in my head. And, with any luck, the heads of my readers. Galley material, yes, but gallery worthy? The longer I thought about that label, the more I realized that what I do when I write truly is Art. Like any painter or musician or sculptor or actor, I look at the world around me and then translate my own experience of it into a new form, a personal, one-of-a-kind articulation of what is, or might be. I have a vision of life that ‘colors’ my representation and allows me to penetrate the surface of what I see to get at the heart of what lies beneath. Maybe my lens of choice is humor, or inspiration, or romance, or fantasy, but whatever it is, it helps me bring a freshness to my subject that is the essence of artistic endeavor. I create with words, and not only is it my calling, but my sacred trust. And now that I understand it that way, I guess I shouldn’t be surprised that I’m an artist. After all, my Father is too, you know. This entry was posted in Encouragement, Writer's Life, Writing and tagged artist, encouragement for writers, Jan Dunlap, Karen Macek, writing, writing life by jandunlap. Bookmark the permalink. Huh, not being a fiction writer I’ve always looked at myself as more of a researcher, technition, or educator. But under your definition I would qualify as an artist. Don’t know if I can get my head around that, but it is definately something to think about. Thanks! Rick, I know the feeling! But the more you think about it, the more you can see that artist is a correct descriptor. I’ve found that seeing myself in that way has actually allowed me to take more creative risks than I used to take in my writing, both fiction and nonfiction. I think it’s a way to give ourselves permission to stretch beyond the standard parameters of what we do. Sacred trust. Really like that as a calling. Thank you. We need to value what we do, and when that happens, we grow as well! I like the painting “Red School House at Sunset.” I am not a trained art critic, but I like the colors and the “mood” it evokes. It’s my sister’s work. I spent some time with her in Savannah in February and we had a wonderful discussion about painting techniques – something I know nothing about – and it really struck me that she and I do the same things, but with totally different mediums! And I also realized I could learn from her craft to better my own! Glad you like the painting! Love this, Jan: “I create with words, and not only is it my calling, but my sacred trust.” I think I might just tweet it (giving you credit, of course)! Ha! Tweet away, Karen. Thanks for reading! I am an artist; I paint word pictures. The reader’s mind constructs the scenes conjured by my descriptive verbiage. I create stories in the imagination. Yes, Melinda! We could think of the mind or the imagination as our canvas. Fun post, Jan! I love thinking of myself as an artist. We’re all creators, small letter ‘c’, and what a joy it is! All the mathematical, scientific left-brainers out there need us – just like we need them. Don’t you just love God’s amazing pallet of people? Absolutely, Cheryl! And here’s my confession of the day – some of my best (and funniest) characters in my novels are drawn from real people. God’s awesome creativity continues to overwhelm me (as well as supplies me with great material) – thank goodness for ‘artistic’ license! I think there is no end to learning to improve craft, Neal. The broader the variety of our teachers, the better. Jan, I’ve never thought of myself as an artist, but I Iike your thinking. Shall try to make it mine, too! Yup. Writing is a creative art, for sure. The older I get, the more I realize that stories are sometimes our best evangelical tools. Who can argue with our experience and our testimonies? It’s worth our time and effort to strive to perfect our craft because our stories could literally save someone’s soul one day.